Master Bedroom: The European interior design of this remodel in Scottsdale's exclusive Silverleaf neighborhood feels both modern and luxurious. Sumptuous fabrics are balanced by clean lines with varying textures and shapes for a surprisingly cohesive effect. Living Room: With cathedral ceilings, exposed wood trusses, crystal chandeliers and of course that sweeping staircase, this formal living room represents the pinnacle of luxury home design. 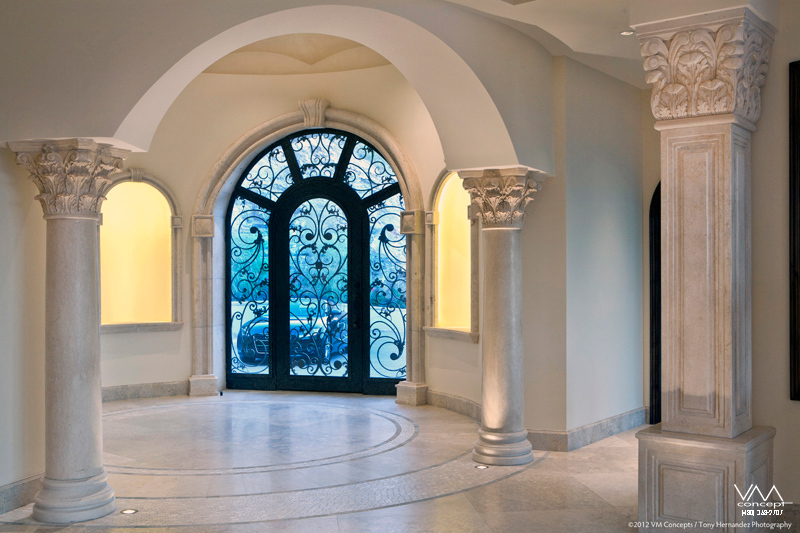 Architectural details like the scrolled iron railing, combined with custom draperies, artwork, furniture and accessories, combine for a breathtaking effect. 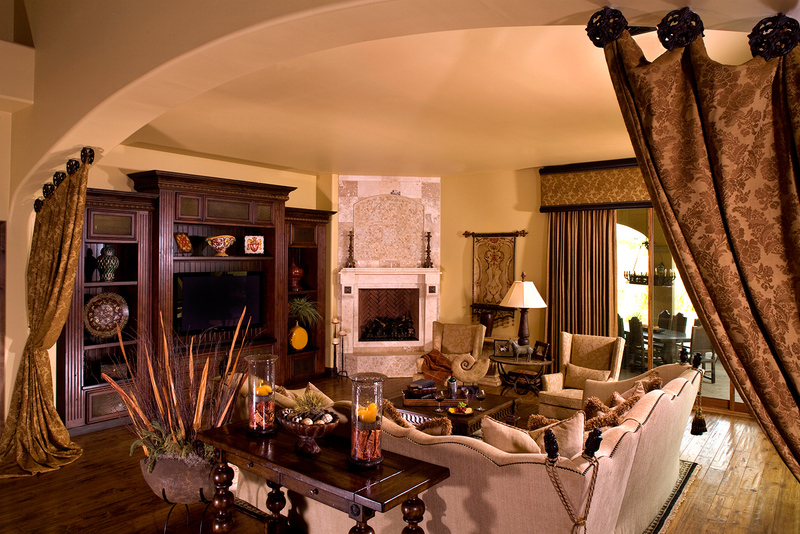 Family Room: Blending creativity with function, the custom entertainment unit and fireplace establish focal points within the room, while rich draperies along the archway lend further distinction between the family room and kitchen. 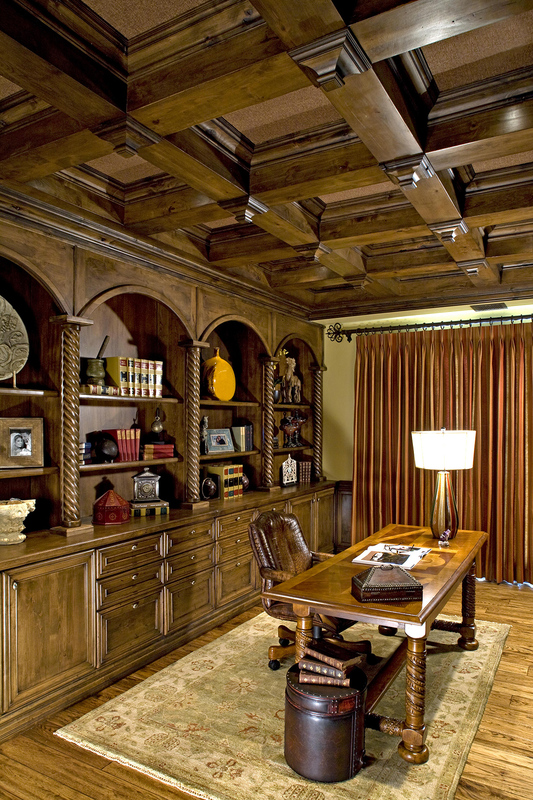 Office: Formerly a golf-cart garage, this office remodel now features stunning coffered ceilings and custom millwork. 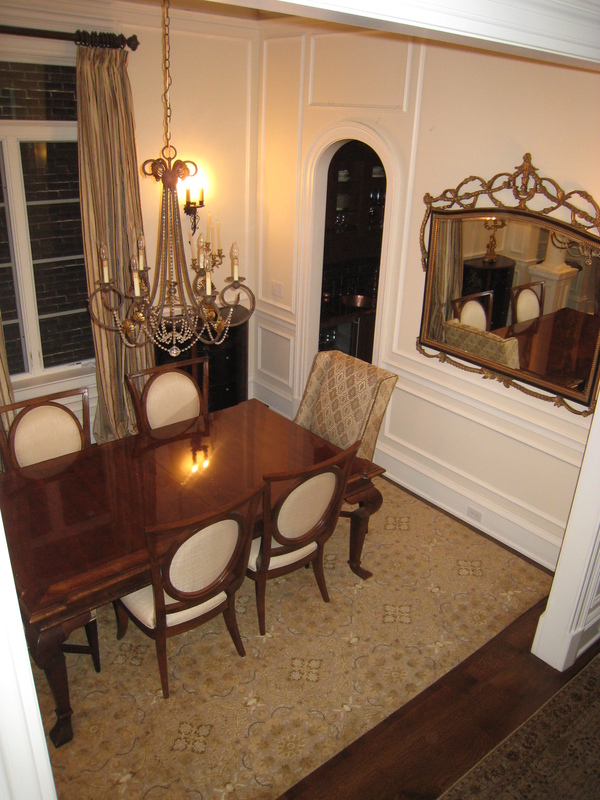 Dining Nook: The architectural details of this dining nook let a small space make a big impact. 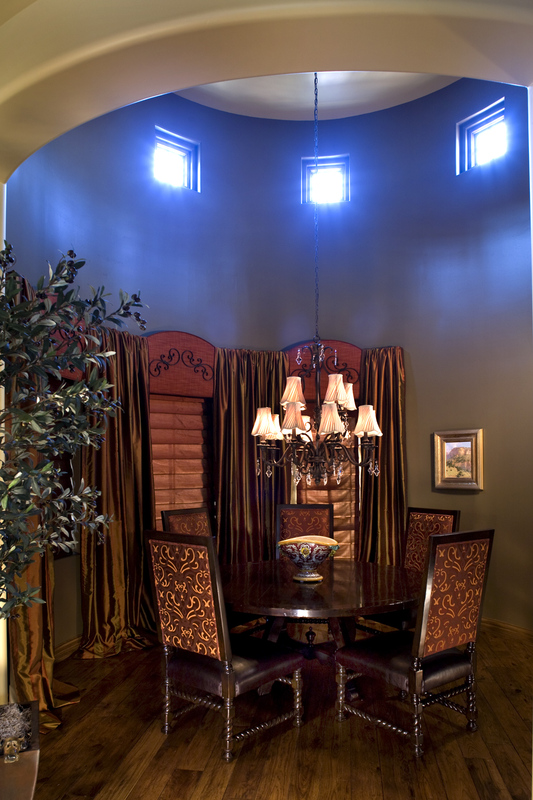 Metallic blue walls lend the area a lofty quality, while custom window treatments ground it in luxury. 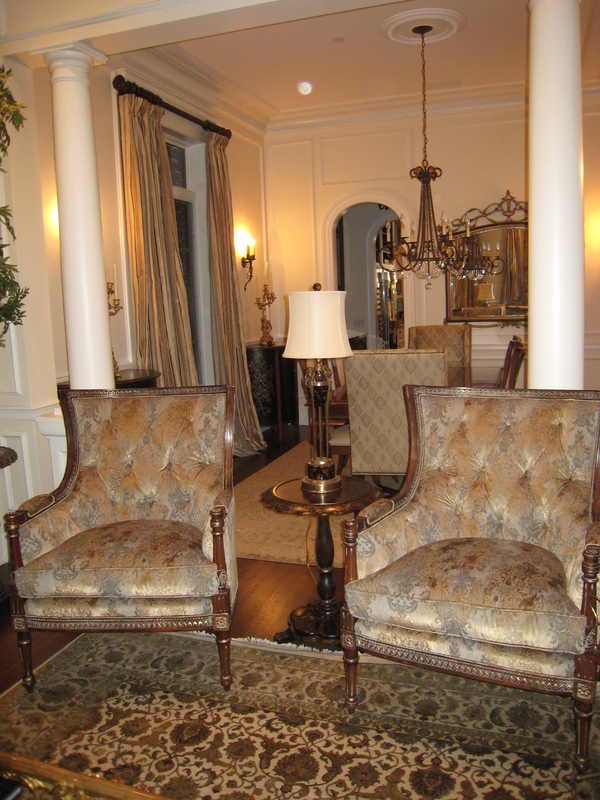 Custom upholstered chairs resonate with the draperies for a unified aesthetic. 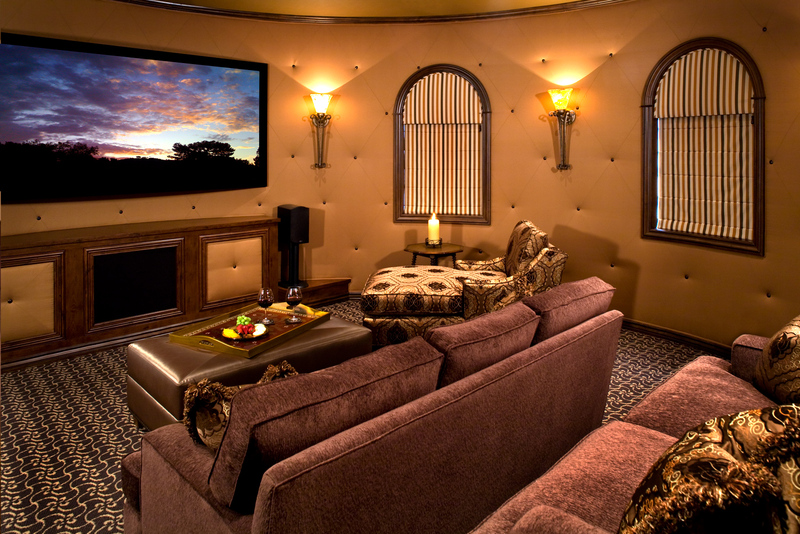 Home Theater: The elegantly cozy ambience of this theater belies the challenges of its design. 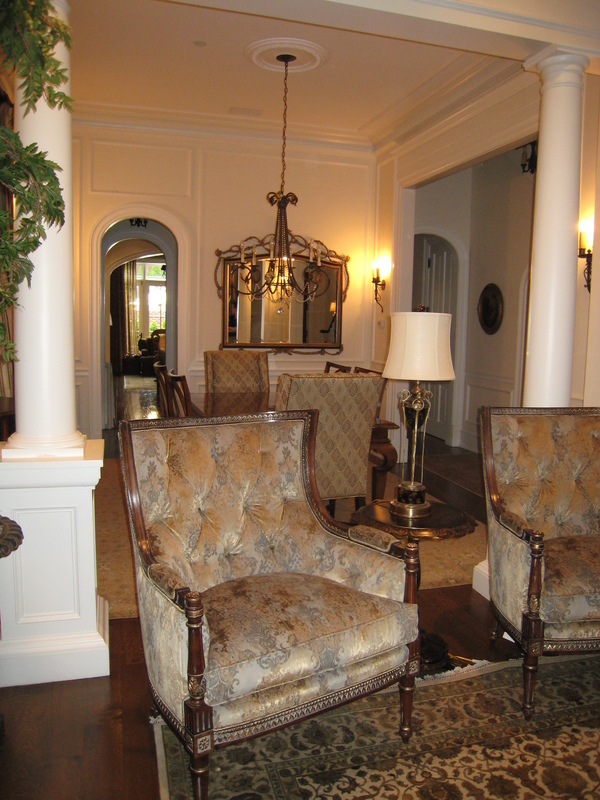 The round walls were upholstered and tufted not just for visual appeal but for acoustical purposes as well. 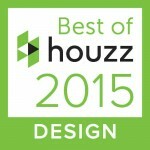 The 103inch projection screen is balanced by a custom-designed cabinet, which conceals the A/V components. And a platform that accommodates additional seating rounds out the space, which feels as good as it looks. 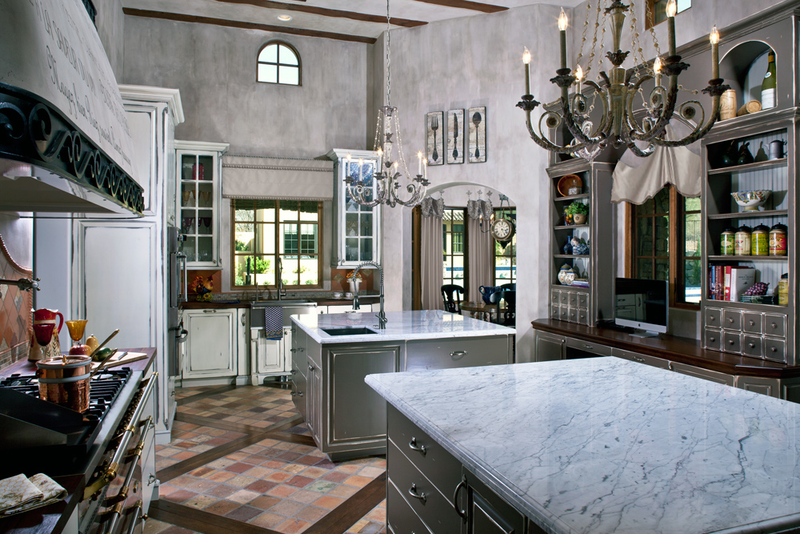 Kitchen: Old World interior design takes a turn for the gourmet in this French Country-inspired residence. 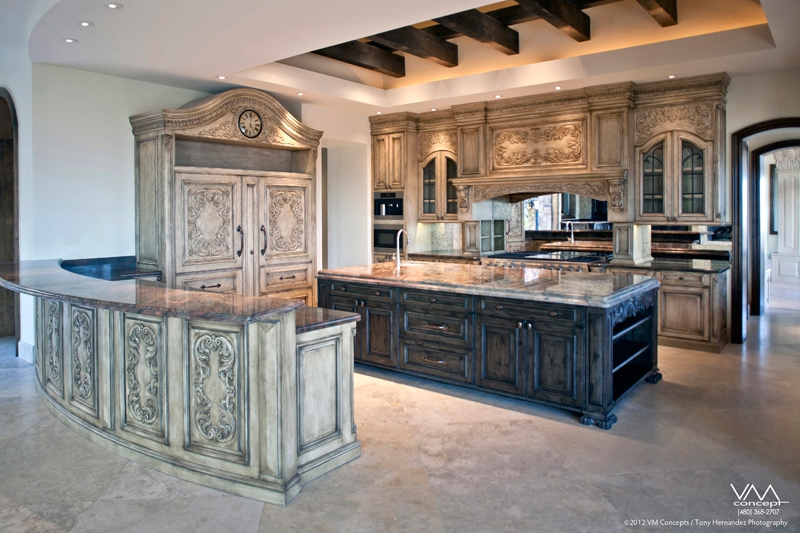 The main components - a Lacanche range, Carrara marble and butcher-block countertops - set the stage for elegance. But the architectural details take it over the top. Reclaimed, century-old French tiles are laid with hickory planks on the floor, while exposed ceiling beams echo the geometry above. A suspended hood incorporates scroll ironwork, and chandeliers create an intimate ambience perfect for entertaining or cozy nights in. 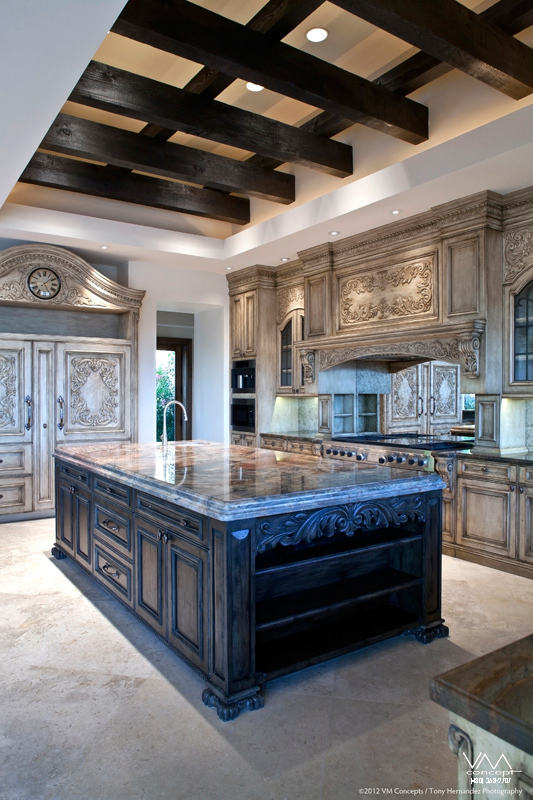 Kitchen: Mimicking wood accents in the floors and ceiling lend both authenticity and visual interest to this French Country-inspired kitchen. 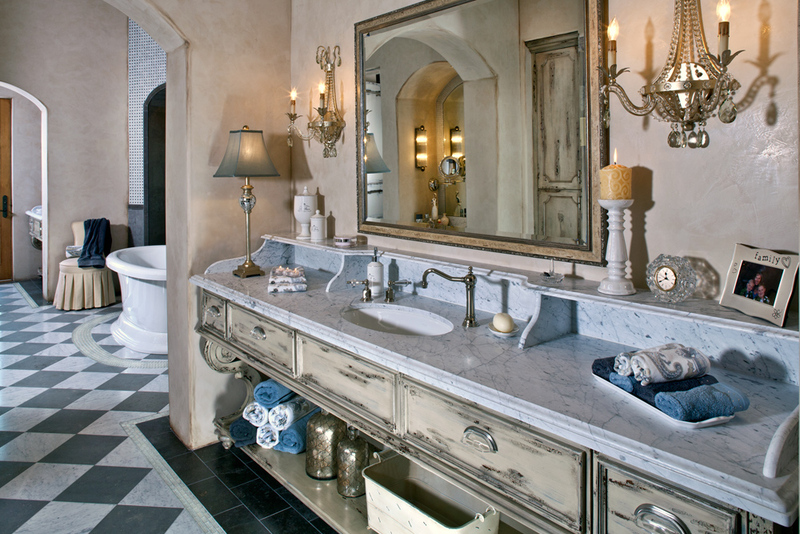 Master Bath: At once relaxed and elegant, the French Country feel of this Paradise Valley interior design is achieved with a custom, open-leg vanity; Venetian plaster; and two types of marble (French Chinon marble on the countertops and Carrara marble on the floors). 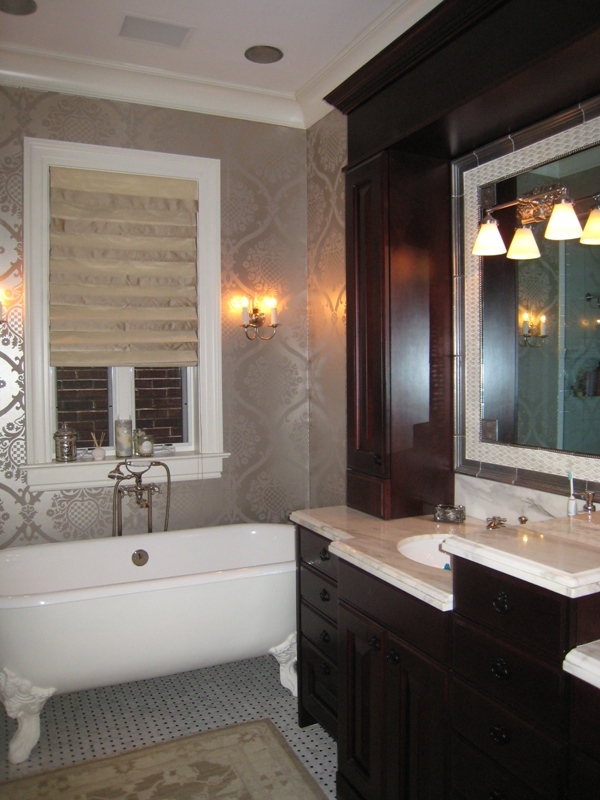 Master Bath: Details like the lighting, mirrors and accessories add both depth and warmth to the master bathroom. 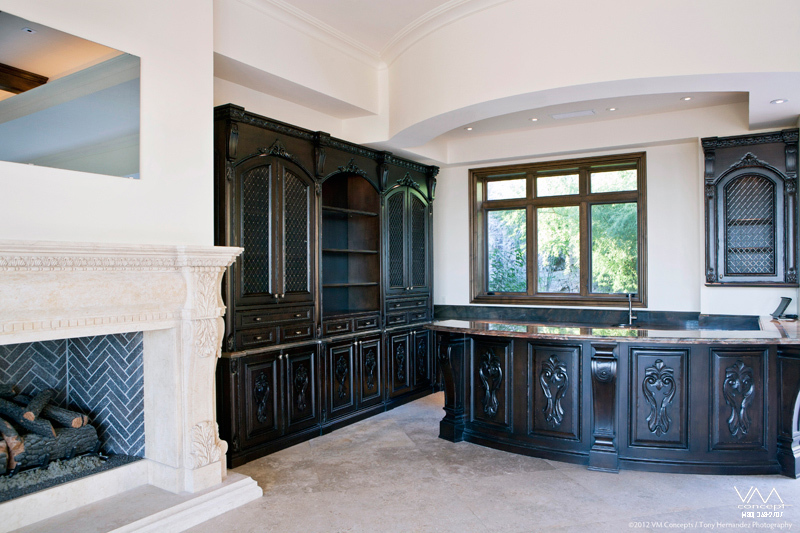 Kitchen: Embracing a European aesthetic, this expansive kitchen boasts several tiers of workstations that feel as richly layered as the custom cabinetry's hand-stained finish. 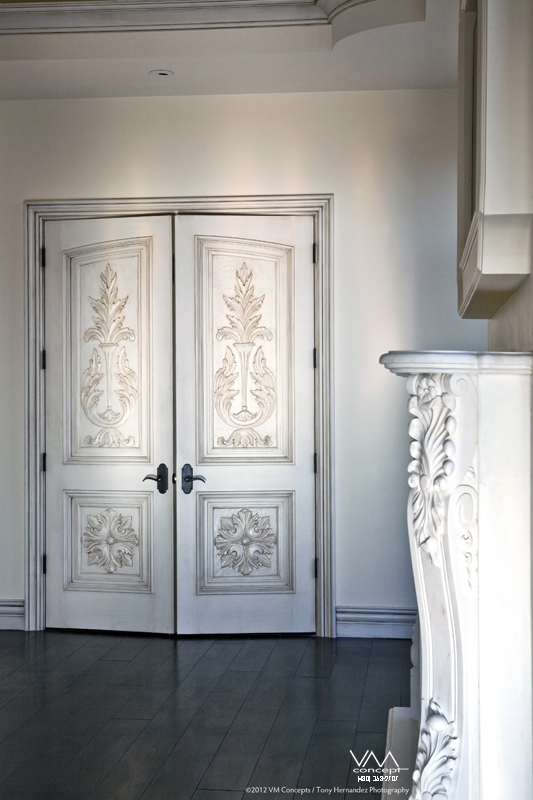 Classical motifs like the cabinetry's acanthus leaf enhance the architectural detail. 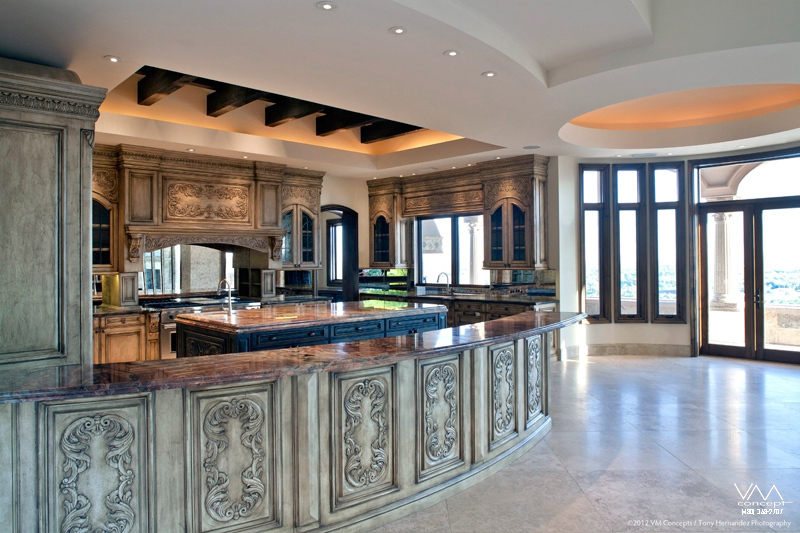 Curvaceous lines in the kitchen naturally spiral out to the adjacent circular spaces and, beyond, spectacular views. 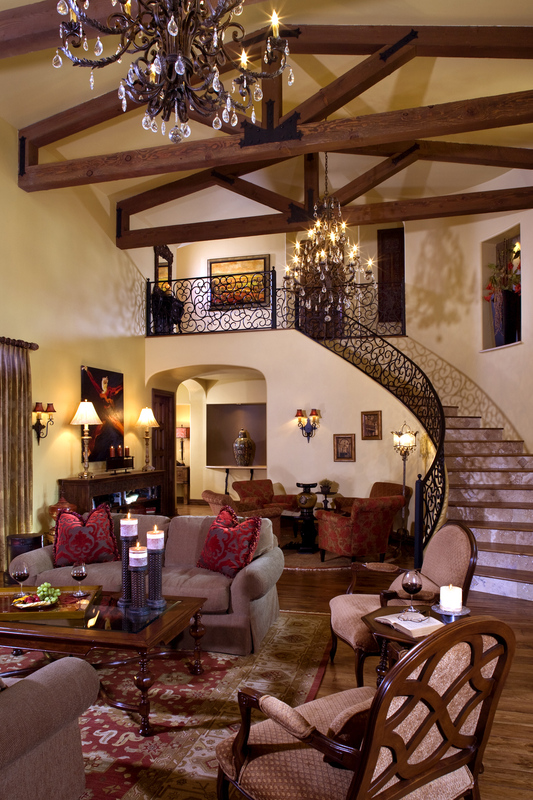 Bar: Dark, rich wood contrasts dramatically with the light color palette in this bar area. Designed to welcome friends and family, the bar also features a beautiful fireplace as a focal point. 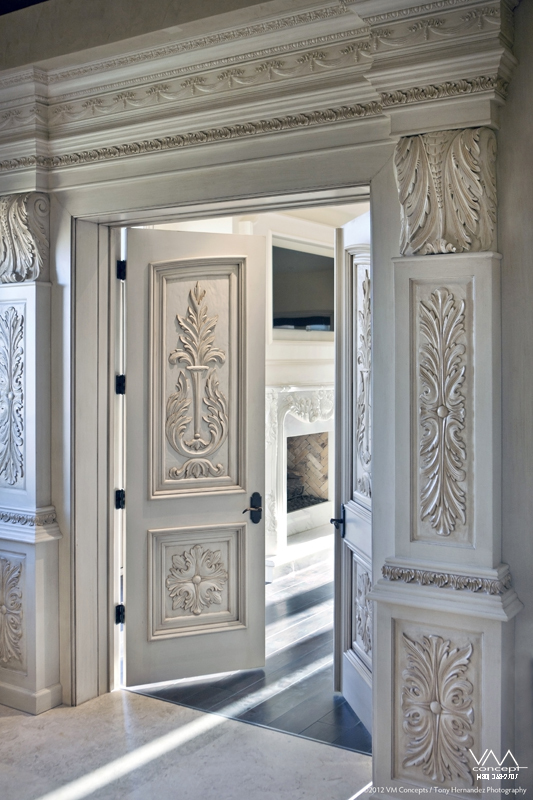 Master Suite: Ornate wood carvings create a dramatic entrance to the master suite of this Paradise Valley custom home. Inside, light walls and dark floors sire a sophisticated ambience, while practical considerations (like an integrated television) are also accounted for. The 180-degree view of Camelback Mountain is incomparable. 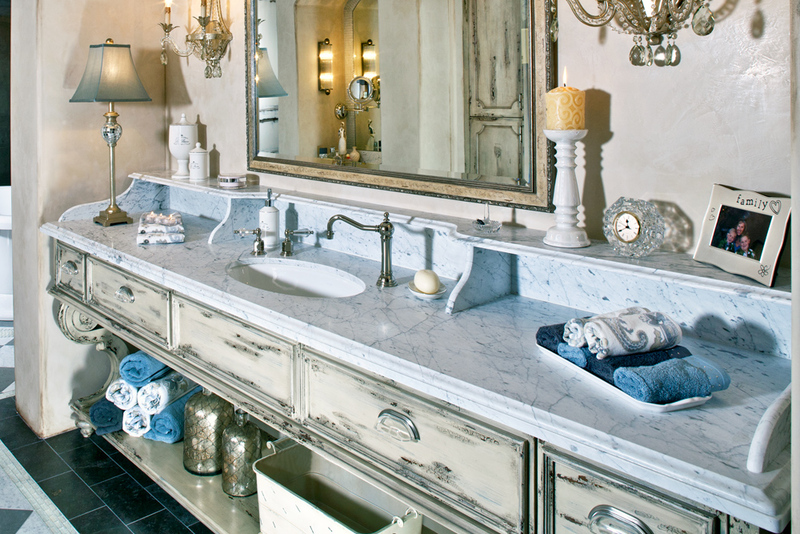 Master Bath: Granite, wood and tile unite in the vanity of this master bathroom, but the sculptural qualities of the built-in pieces add interest. 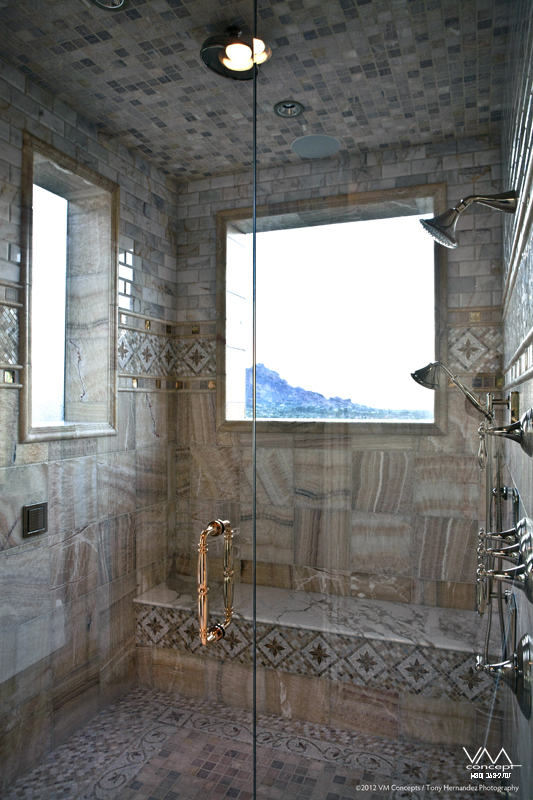 The master shower, meanwhile, celebrates the luxuries of Paradise Valley interior design. Varying tile patterns bring the small space to life, while the stunning mountain views are complemented by only the finest fixtures and finishes. 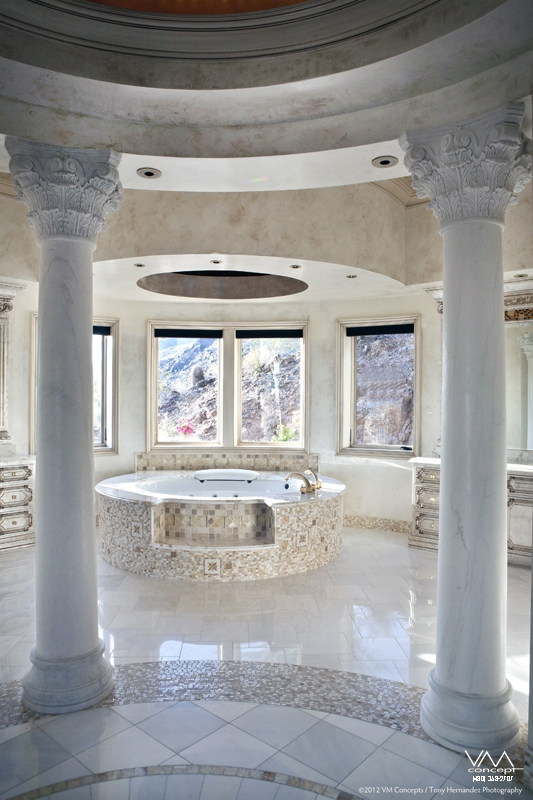 Evoking the classical opulence of Roman baths, this master bathroom's circular shape is matched by a circular tub that's surrounded by marble Corinthian columns. 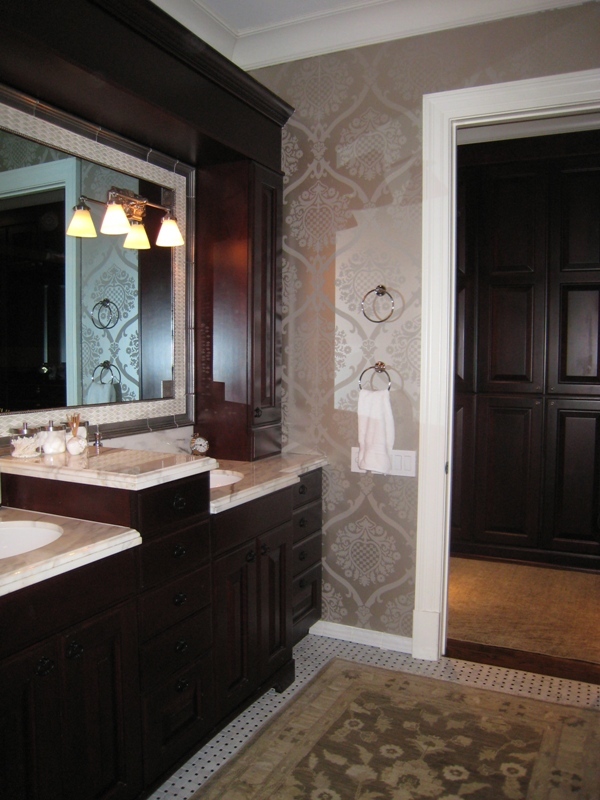 Rectilinear geometry, neutral colors and just the right amount of contrast lend this master bathroom visual depth. 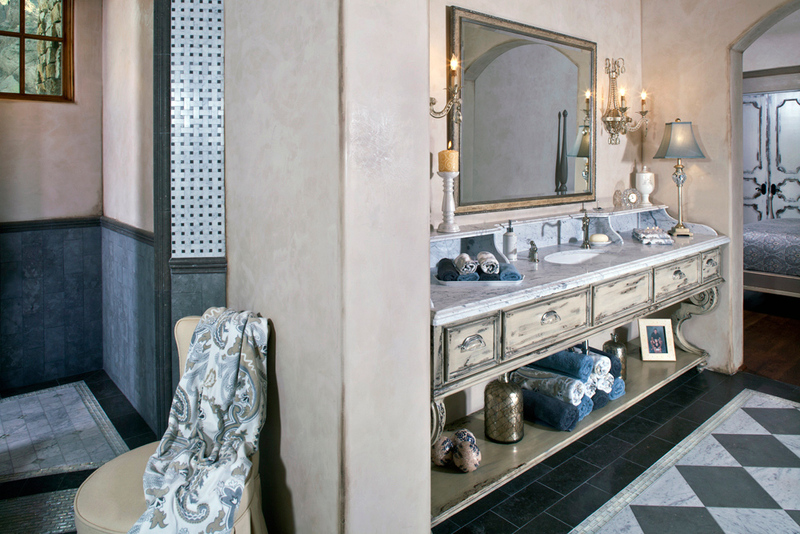 Stately vanities with detailed carvings, sweeping corridors and Corinthian columns evoke the sense that this palatial master bathroom is fit for a king. 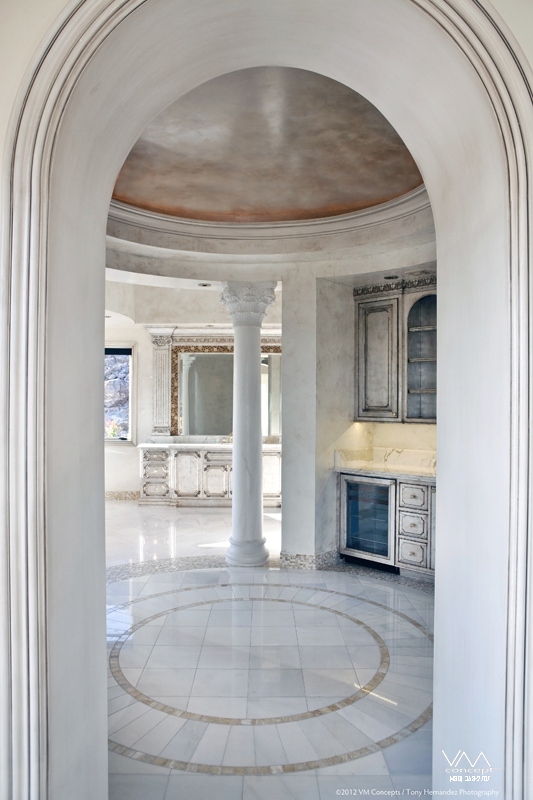 Living room: Flanked by Corinthian columns and graceful, custom-shaped windows, the fireplace serves as a soothing focal point in this Paradise Valley custom home. 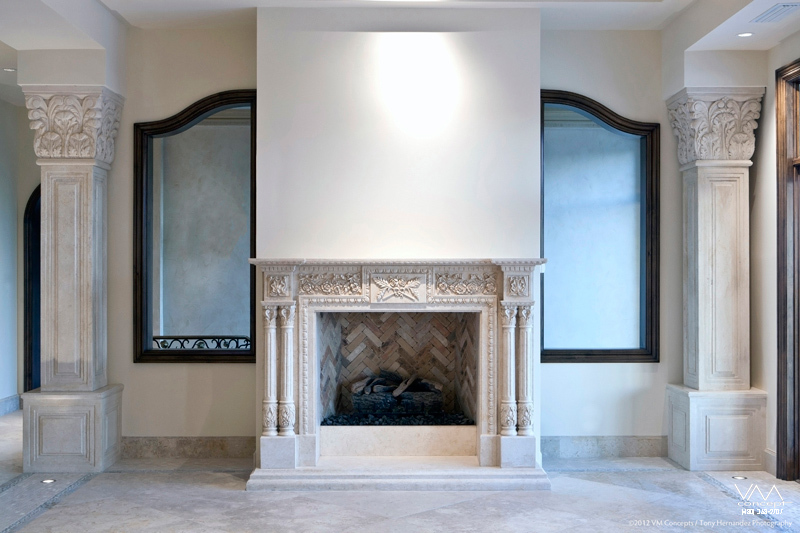 Whitewashed brick set in a herringbone pattern lends texture to the inside of the fireplace, while the curved mantel feels at once traditional and sculptural. Living Room: This 7,800 square foot Chicago brownstone is European - inspired city living at its finest. 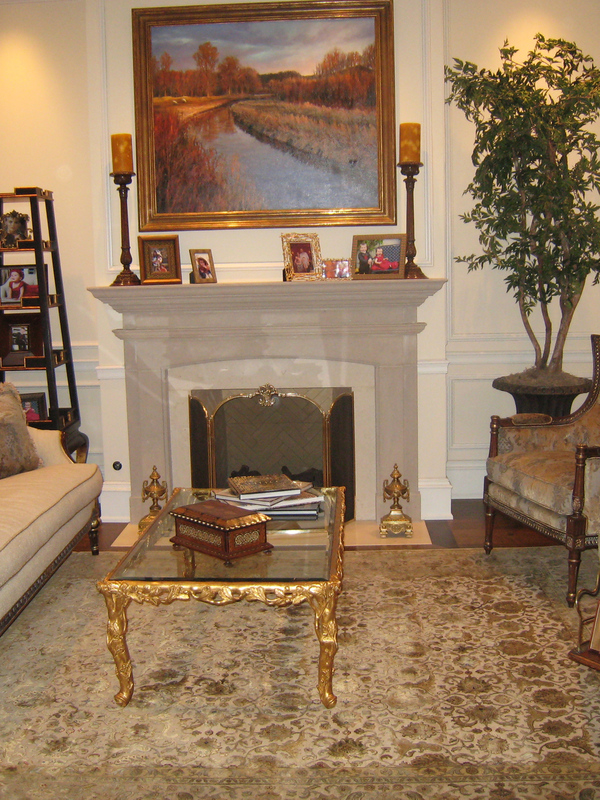 A traditional limestone fireplace is the focal point of this small 12'-0" x 14'-0" formal living room. 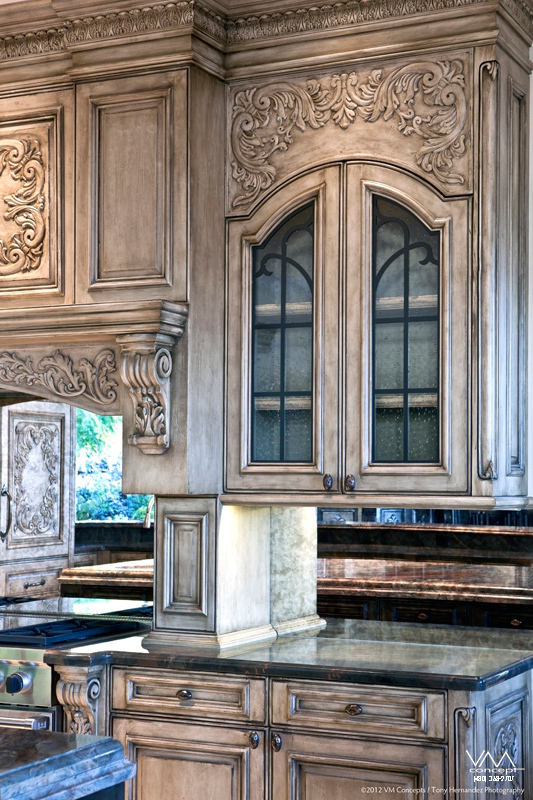 The French-style furniture is scaled to fit this intimate yet classical space. Dining Room: It is hard to tell if this is a Paris flat or actually a Chicago brownstone when walking through this 7,800 square foot home in the Windy City. 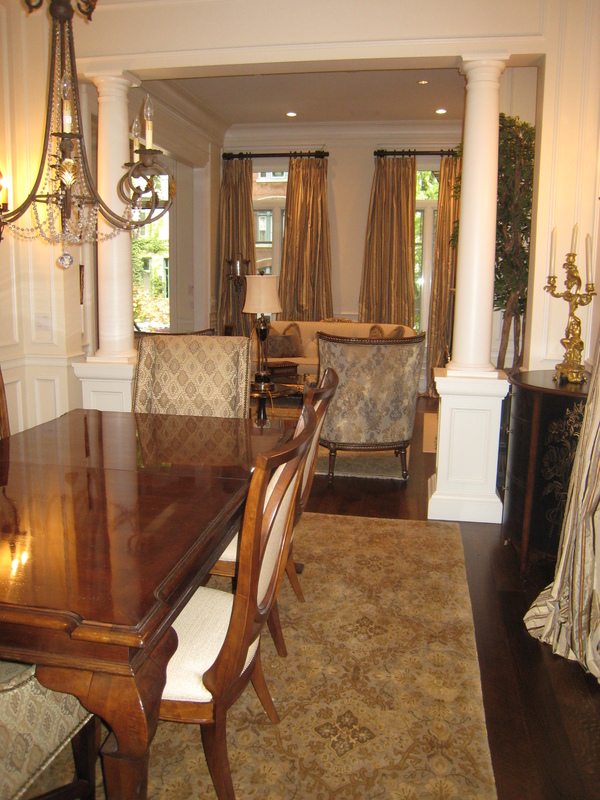 17th century antiques highlight this formal dining room that is open to the adjacent formal living room. 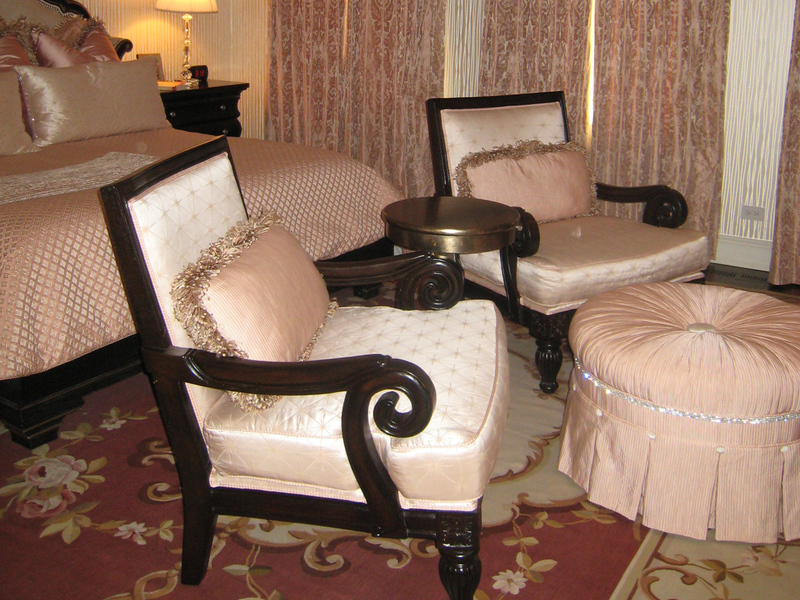 The traditional European feel of these two intimate spaces is unmistakable. 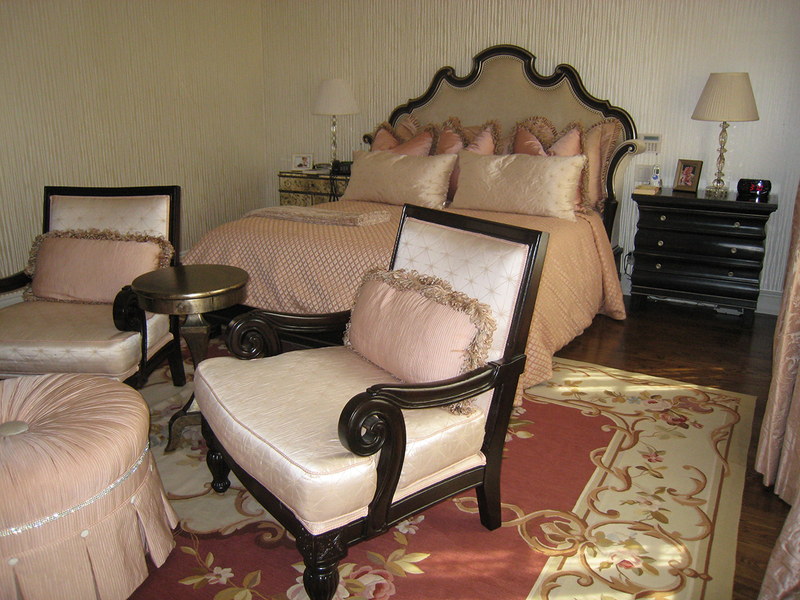 Master Bedroom: An Aubusson rug anchors this elegant Chicago master bedroom. 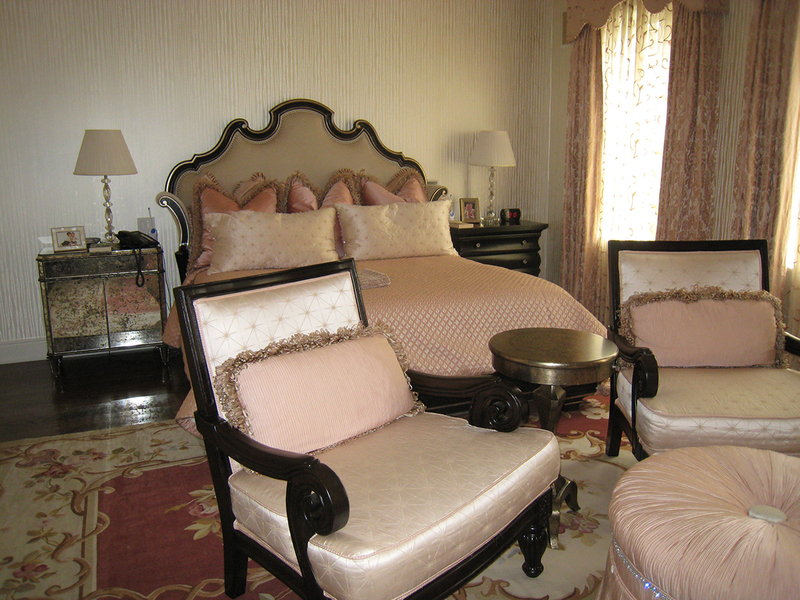 Luxurious silk fabrics in soft pinks are contrasted by the rich wood finish of the furniture. 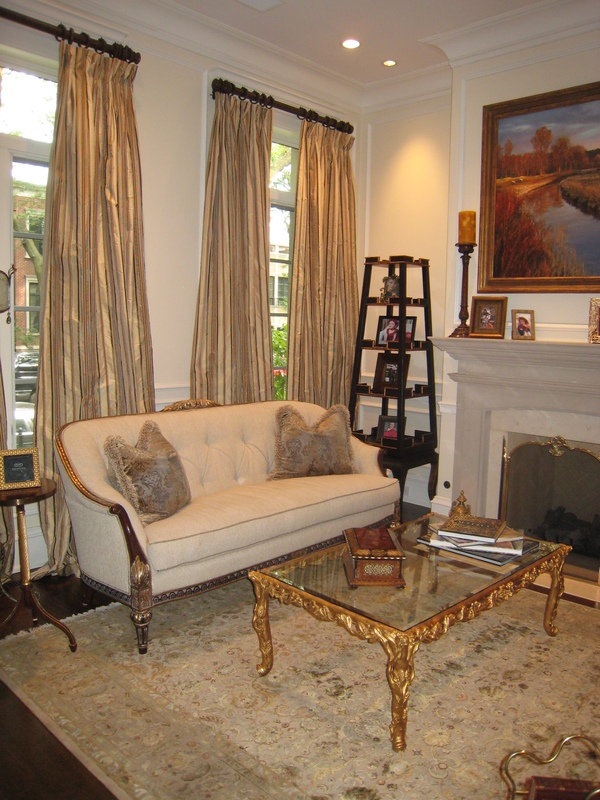 Custom upholstered valances, and a tufted ottoman offer a feminine touch. The ambiance offers a tranquil escape from a busy day.